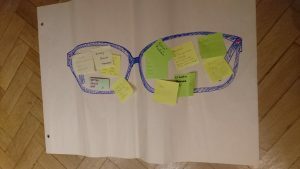 Draw/ put a picture of a pair of glasses onto the large piece of paper. Ask your group to think of who they know who is currently spiritually blind. They should then pray for Jesus to open their eyes. They should also pray that their friendship with them will help to be the visual aid that they need. They should ask God to help them to be witnesses and intercessors. They can write the names of the people who came to mind on the post-its and stick them onto the lense of the glasses. We linked this intercession to Acts 9: The conversion of Saul/Paul.